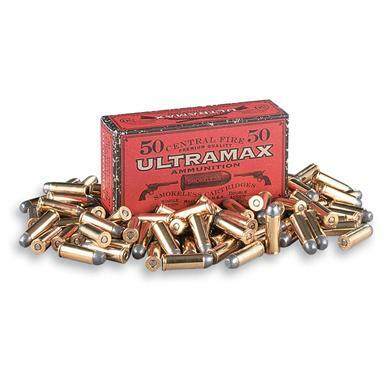 New Manufactured .45 Long Colt Cowboy Action Ammo. With the velocity and gusto of the Wild, Wild West. Fire away with this new Ultramax® .45 Long Colt Ammo for the kick you want and expect! Yeehaw! We always get excited when we find great Ammo like this Long Colt. We'd like to think if Wyatt Earp or Wild Bill Hickok were still alive today, they'd think nothing of choosing this Cowboy-Action ammo! Hypothetically speaking. Each smokeless round is New manufacture, and can be reloaded 2 to 3 more times. Every brass cartridge is tipped with a flat nose lead bullet, and each is loaded to lower velocities for rapid shooting! Order Today for Wild West Action!